/ News / WAYNE Pumps / WAYNE Pumps Announces New Cast Iron Sewage Line Built In The US. WAYNE Pumps Announces New Cast Iron Sewage Line Built In The US. Harrison, OH – WAYNE Water Systems announced today their WAYNE Pump line of residential and light commercial sewage pumps being built in the USA, with enhanced features such as cast iron components and several switch options, including automatic, manual, as well as tether and vertical float switches for tight spaces. These high performance pumps are assembled in the USA with foreign and domestic parts. A sturdy cast iron 1/2 HP pump with a maximum flow rate of 8,400 gallons per hour and snap-action mechanical float switch for automatic operation or a piggy-back tether float switch for automatic or manual operation. 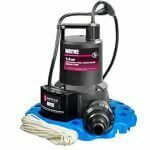 Designed for residential and light commercial use, the durable pump has an engineered flow director shaped to prevent debris from interfering with switch operation. 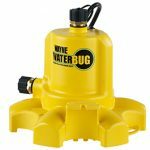 Cast Iron Convertible Well Pump (Model CWS50, CWS75, CWS100) – a line of pumps with maximum flow rate of 588 gallons per hour with dual voltage. The pressure switch is pre-set at 30-50 PSI for automatic operation. The durable cast iron volute with dedicated priming port for volute filling is designed for wells 0 ft. – 90 ft. in depth. Jet assembly required (sold separately). 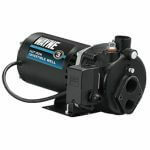 Shallow Well Jet Pump (Model SWS50, SWS75, SWS100) – a line of pumps with a maximum flow rate of 630 gallons per hour. With the same dual voltage and motor as the Convertible Well Pump, it is designed for wells 0 ft. – 25 ft. in depth. Cast Iron Transfer Pump (Model PC4) – a ½ HP pump with a maximum flow rate of 1,450 gallons per hour (at 5 PSI). 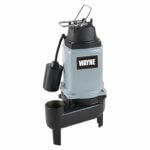 The pump boosts line pressure up to 50 PSI and features a rugged, cast iron pump housing and motor with easy-priming outlet. It connects to a standard hose. “We have made significant investments that will allow us to bring back more production to Harrison, OH,” adds Tinnemeyer. 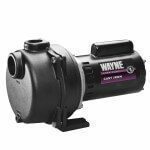 The new WAYNE Sewage Pump products and others are available at home centers nationwide. 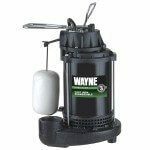 To learn more, visit www.waynepumps.com.